Senior housing and care nonprofits simply can’t do things the same-old way — especially as for-profit providers ratchet up the pressure in many markets across the U.S.
That was among the top takeaways during a Tuesday afternoon session at this year’s LeadingAge Illinois Meeting & Expo in the Chicago suburb of Schaumburg, Illinois. The discussion was framed by the many changes taking place in the not-for-profit senior living sector, including the growing number of older adults in the U.S., and the fact that they have more housing choices than ever as they age, many of which lie on the for-profit side of things. Although the pace of new for-profit development has slowed somewhat in recent months, the trend is still driving up competition among senior housing communities for both new residents and workers. The competitive state of play makes it important for senior living nonprofits to stand out in their markets, or risk being left behind. One potential opportunity for nonprofits to differentiate themselves lies in active adult communities, a product type that is still mostly dominated by for-profit providers. The idea is that opening these types of communities could help attract more members of the crucial baby boomer demographic. Other panelists, like former national LeadingAge President and CEO Larry Minnix, took a different viewpoint on the topic of active adult. 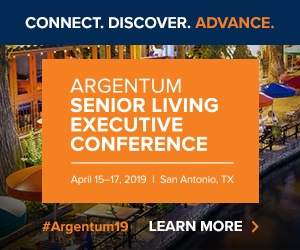 Even if they don’t build active adult communities outright, senior living nonprofits should still understand the product type, said Joe Hassel, a principal with New York City-based architecture firm Perkins Eastman. That might include simply touring these communities to understand what they look like and what kind of people choose to live there. Instead of aiming to beat every competitor at their own game, nonprofits should also think about finding more ways to work together, according to Jesse Jantzen, CEO of Arlington Heights, Illinois-based Lutheran Life Ministries. That might include partnering with a local home-based services provider, pooling resources with similar nonprofits or finding new ways to work with a local hospital or health system. But those partnerships don’t need to be with other senior housing and care stakeholders, either. In fact, they can lie in some unexpected places — like pizza places. Nicole Fallon, vice president of health policy and integrated services for LeadingAge, shared an anecdote in which an eatery in Pennsylvania realized that many of its customers were older adults, and so began offering to deliver their medication with their pizzas. While most state regulators would likely have a fit upon learning that a delivery driver was also carting around medications for seniors, the example was meant to illustrate how out-of-the-box thinking can lead to innovative partnerships. “My point is, who would have thought that maybe our partner should be the pizza delivery service because they’re already serving our clients?” Fallon said. Above all else, senior living nonprofits should avoid becoming too insular in their traditional ways — or “inbred,” as Minnix humorously phrased it.